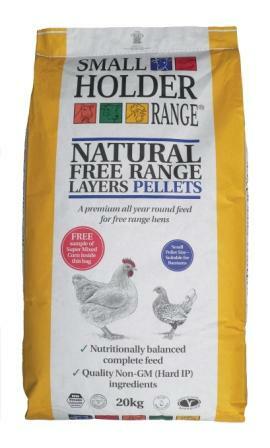 Smallholder Natural Free Range Layers Pellets with added Omega 3 oils for healthy birds and wonderful eggs. Contains grass, maize and marigold to promote a naturally golden yolk colour. Small pellet size - suitable for bantams. Available in 1kg, 5kg and 20kg bags. Feed all year round, on a free access basis. On average, hens will eat 100-150g (4oz) per day. As the hen's crop can only hold about 100g it is best to give grain or mixed corn separately, later in the day, or she will be unable to eat sufficient pellets or meal. By feeding Smallholder Natural Free Range Layer Pellets, you can make a significant difference to the eggs they produce. The eggs will be naturally higher in omega 3 oils, thus making them healthier for you and your family. Providing the hens with access to grass and greens will also further boost the omega 3 content of their eggs.